Tweed Cottage is set in the heart of the conservation village of Paxton. The cottage is Ideal for a single guest or a couple who love a quiet retreat. 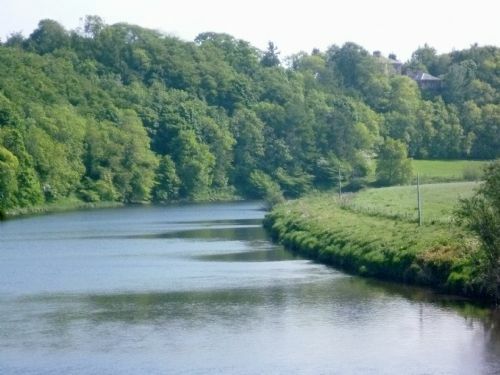 Close to the rivers Tweed and Whiteadder there are lovely walks for a dog and spotting wildlife. The historic town of Berwick-upon-Tweed and the coast of Berwickshire and Northumberland is only five miles away and is Holy Island a short drive. Close to a welcoming pub. This holiday cottage for 2 adults was very comfortable and cosy. There was everything needed for a self catering break. The pub just yards away was very good for having a meal. Berwick on Tweed was only 5/6 miles away with plenty of shops etc. Paxton is a very nice little village. ;We enjoyed a visit to Paxton Hall nearby. We will keep information on Border Holiday Cottages for future use. We loved this little gem tucked away off the A1 near Berwick on Tweed. which is a must visit . Tweed cottage was very cosy. It is very well equipped a short walk to the local pub. The cottage was very convenient for visiting Paxton House and it's beautiful grounds. Berwick on Tweed is a short drive away and from there Edinburgh can easily be reached by train. A lovely cosy little cottage ! We had a wonderful stay - not only a great base for exploring the north east , but we also spent a lot of time in the evenings just relaxing in the warm homey cottage ! The welcome basket was a wonderful touch and the homemade goodies - delicious ! We had a lovely short break based in Tweed Cottage, which is very cosy, comfortable and ideally located to explore a beautiful area of the country. The owners were very helpful and provided a tasty welcome pack of local goodies. Great food pub a few minutes walk away was an added bonus. We met Richard on our arrival and he provided all the information about this cottage & Paxton. The cottage is small but perfect for two. For a guiet stay on the borders it is a wonderful location you have the local pub at your doorstep or Berwick 15 minutes away. A lovely cottage cosy and quaint. Had a lovely stay and would definitely return. Owners very helpful and informative. Great place for a couple to explore the area. Very quiet with a car passing about once an hour and a bus 4 times a day, own transport essential! Car park is very close and almost in view of the front door. Hosts met us and gave all information needed which was a great help. Definitely consider returning as great value for a cottage. Very good cottage with good facilities in a great location with friendly neighbours. Welcome pack much appreciated. Only improvement would be to replace one of the chairs for use with the dining table as the seat was warped and not very comfortable. So pleased that you enjoyed your holiday and took the time to leave a review. Thanks for telling us about the damage to the dining chair. Both have been replaced, of course. Cute little cottage with everything you need. Very good location for exploring the area. Local pub with excellent food was a bonus. A very pleasant location, with friendly pub selling great food within yards of the property. Cottage was cosy and comfortable with everything we needed for a week's break. John and Christine were very helpful and were there to welcome us on our arrival. 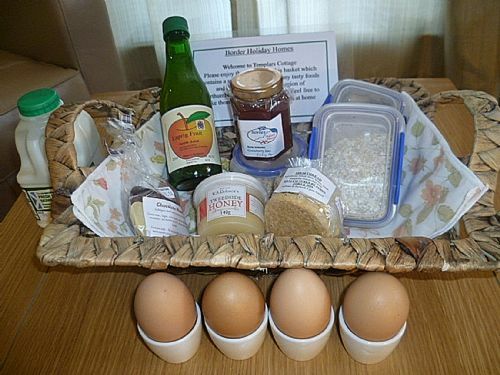 Welcome basket provided with local specialities. We had a great time, thanks. Very lovely cottage handily located for border area. Cottage has all facilities whilst retaining character. Owners v helpful with advice on local area on arrival. contact from the owners at booking , before travel and on arrival was helpful and welcoming. we enjoyed consuming the local produce provided in the welcome pack. the cottage was cosy for two and contained all the facilities we required, we self-catered for breakfasts and some evening meals. the local pub was welcoming and very handy although the menu was a bit limited for our taste. we chose Paxton as a centre for exploring the Borders, coastline and Edinburgh ( by train from Berwick) and the location fulfilled our expectations. would highly recommend a visit to Paxton House which is "on the doorstep"
we would stay again when we next visit the area. We were looking for a cottage for three nights where we could take our young dog. We found Tweed Cottage and it was perfect. We were met by the owners who were very friendly and helpful and suggested places to visit and eat. The cottage was small but had everything we needed, including dog blankets and treats for us and the dog!! Great location for driving into Berwick and visiting local beaches. Would recommend Border Holiday Homes, and hope to re-visit sometime. Sue. Lovely quaint cottage in quiet village everything you need and more. Paxton house well worth a visit as is the pub in the village. Enjoyed our stay. Tweed cottage is in a great location which enables you to explore the surrounding area. The cottage was very comfortable and was very well equipped. Lovely bathroom with great shower, comfy bed with lovely bed linen. This is a great little hidden gem. This is a small cottage with everything you need packed in, including a small dishwasher and washing machine. Electric fire in lounge and electric boiler for heating (we did not use the latter); lots of hot water and nice walk in shower. Owners were keen to be helpful and came over when we arrived just to welcome us. Nice welcome pack of local produce. Berwick on Tweed is close by for shopping, Tesco is 4 miles away with Morrisons slightly further. Cottage's off the road parking spot is close to the cottage. Lots of local walks and ideal situation for visiting the many local attractions (Farne Islands, Abbs Head, Heavy Horse Farm, Honey Farm, Duddo stone circle, Ford and Etal etc). Well deserving of another visit. Everything was to perfection. Well situated . Quiet and friendly. Quiet and cosy little cottage. Situated in a friendly village. The food at the Cross Inn was excellent . Well deserving of another visit. We set off looking for a relaxing week; we were not disappointed. Cottage has been very well restored. The location is good for North or South access especially the coast. Short runs to excellent dog beaches. Not having a garden attached does bring some late night challenges if dog needs out. Would recommend it. A comfortable well equipped cosy cottage in a very quiet village. Hosts attentive. Area steeped in history. Only 10minutes drive to Berwick; a quaint walled town ,20mins to wonderful Holy Island; excellent 360' viewing tower, lots of coastal walks & beaches. Local pub with good food-walking distance. 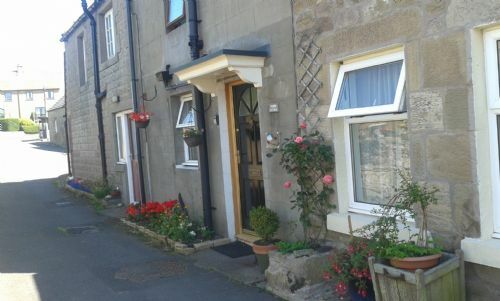 A lovely quaint cottage, very comfortable and has everything you need. In a very quiet location. Pub just across the road is excellent. Would definitely visit again. Great cottage with very helpful owners who have made sure there is everything you will need. Beautiful surroundings and great pub! Thanks for that lovely review! Tweed and Paxton are lovely places to stay. We love having our places and do hope you'll come again soon. BBC Scotland has been having a great series about the Tweed, "The River" just recently with great pictures of what happens at Paxton on the river - you'll really enjoy that! A dinky little cottage, very comfortable and well-equipped. Own parking space a bit tricky , but ok after a few manoeuvres. Lovely little village , lots of country walks and good pub close by. Delightful cottage in very quiet, appealing location. Ideal for a weekend getaway. We thoroughly enjoyed our time there. My stay at Tweed Cottage was very pleasant in great spot .just one wee problem with the heating could not get it to work . booked last minute , wanted somewhere in or near Berwick on Tweed ..
To our luck we found this cottage . Beautiful places to visit around within half hour drive and Berwick which is 10 mins away has great supermarkets . 4 days not long enough ,this area is a hidden gem if you like to get away from cities and. enjoy walks . Get a good map and see the area . Paxton house was such a l;ovely place to walk to from the cottage, lovely gardens down to the picturesque river Tweed and onto Chain Bridge . .
Strolling around Berwick just great , walking the Walls and taking in the sea view . we appreciated a lot this cottage where we felt as in our home. The owners organized a warm welcome with nice presents to start our stay. We enyoyed too the very good food in the restaurant of the only pub of the village. Paxton is a good place to visit easily the borders, the village is very quiet but very closed of the main roads. We had a lovely visit to Paxton, quiet location and easy to visit Berwick, the holy island etc. Cottage is Compact but sufficient for 2 people with everything you need. The cross in does lovely food also. Sofa wasn't to my comfort but apart from that we enjoyed ourself!! Our cats were also welcome at the cottage which was nice! This cottage is ideally situated to get to the Paxton House Music Festival, I walked there and back if the weather was fine but drove if there was rain. This was my second year the only slight flaw was the dishwasher was out of action so had to revert to hand washing - how terrible! ! I hope to be back next year. Thanks for coming back for a second visit. The cottage is ideal for the lovely grounds and riverside walks at Paxton House. The dishwasher is now repaired!! A lovely little cottage in a good location with a very friendly pub nearby. Well thought out accomodation with everything you need fit amazingly into the compact space available. Very clean and comfortable and the welcome pack was a very nice touch. Lots to see and do within a short driving distance. The small garden would provide a nice spot to sit out on warm evenings if it were given some much needed attention and why does the bathroom sink need to be so high? Thanks for leaving your review. The garden has been sadly neglected with the rainy days we have had through July. I wonder if Alan Titchmarsh is available to help out. The sink is positioned at the standard height according to our plumber. Excellent location for exploring the beautiful Northumberland countryside and coastal beauty spots. Cottage was in a quiet location, clean, tidy and well equipped. Great place to return to after a full day of walking and exploring this wonderful area. Hosts John and Christine on hand by phone if needed and welcome basket a nice touch. Tweed Cottage is a compact, cosy and very nicely appointed place to stay, ideal for a weekend away. The owners were very friendly and helpful, both before and during our stay. Paxton is a lovely village, the neighbours were pleasant when we met them walking outside, and supermarkets at Berwick are just a few miles away by car. We would happily book again with Border Holiday Homes. Ideal for two people and a dog. We very much enjoyed our stay at Tweed Cottage. The owners are lovely people and Mr. Ward gave us some excellent tips for places to visit, as well as telling us the best places to walk the dog. The cottage is tiny but very comfortable and it had everything we needed for a long weekend, plus various locally-produced treats including beer, jam, eggs and soap. I was particularly glad of the soap as I forgot to pack shower gel. Another nice touch is that there is a cafetiere and ground coffee provided, something we really appreciated as neither of us drinks instant coffee. We found the cottage absolutely ideal for our needs, however it's worth noting that the stairs are narrow and quite steep, as you would expect in a Georgian cottage, and it might feel cramped if you were staying with a dog larger than a labrador. All in all, we were very happy with our stay and will definitely consider staying there again, or in one of the other properties, next time we visit the area. So glad you enjoyed your stay. 3 hundred year old farm workers cottage is a wee bit small by modern standards but we love it & enjoy staying there ourselves with our lab. who is much bigger than yours! The village itself helps by being dog friendly so do hope you'll come again. Needed somewhere to stay to celebrate our wedding anniversary ( we did not have a honeymoon as we needed to get back to feed the chickens) and was struggling to find somewhere when this popped up. Although we have been regular visitors to the borders, we have never been to Paxton village but the cottage filled the need for me, my wife and the wee scabby dog (only joking, see Connoly D.I.V.O.R.C.E. ) for a short stay. Well impressed with the cottage, and with a good pub / restaurant within staggering distance not to mention plenty of walks for the W. S. D. what more can you say. Liked the village, so much so that on the Monday morning we checked out the estate agents in Berwick. NOTHING. Got me mega creep points with the wife especially as she got to go to Chirnside chippy for her battered haggis supper which we ate in the shadow of the Jim Clark memorial. Just for the record, I stuck to fish and chips. 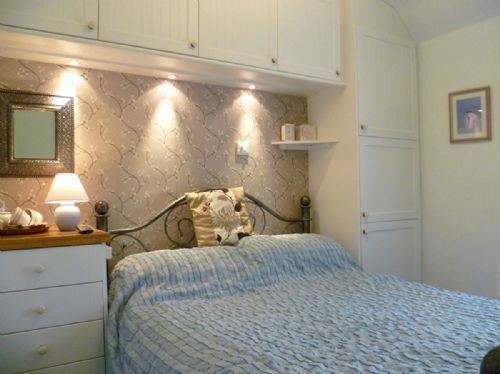 This is a sweet little cottage 'made for two' and was ideal for our three night stay. The interior decor is tasteful and the area is very peaceful and relaxing with nice local walks. In addition it is a good base for exploring Northumberland plus only one hours drive to Edinburgh or 45 minutes by train from Berwick. As other reviews have previously mentioned the garden is not attached to the property which adds to the quirky charm of the place - however the garden is in need of a spruce up as the grassed area is more weed than lawn and the seating is very tired and in need of some tlc - otherwise its a pleasant space to enjoy a morning coffee or an evening drink. The food in the local Cross Inn was delicious and the property owners kindly offered to book us a table ahead of our stay which was great. Excellent holiday cottage, one of the best we have enjoyed. Comfortable, well equipped, easy to use therefore very relaxing. Carefully chosen furniture and fittings enhance the experience. Warm and cozy, with a lovely welcome pack of locally sourced goodies ranging from eggs to soaps. Good parking and perfectly located for exploring the whole area and coastline. Good shopping in Berwick. We enjoyed our stay at Tweed Cottage. would come again. We enjoyed our stay at Tweed Cottage. Would recommend this cottage.eveything you need was there. The only slight downside was the garden wasn't attached to the cottage. Cracking little cottage in a great wee village. The village of Paxton is just far enough out of Berwick but not that far, with beautiful countryside all around. The cottage is compact witha clean modern interior, making it comfortable and cosy. Lovely owners with a great manner. Would highly recommended staying. n foot a must. 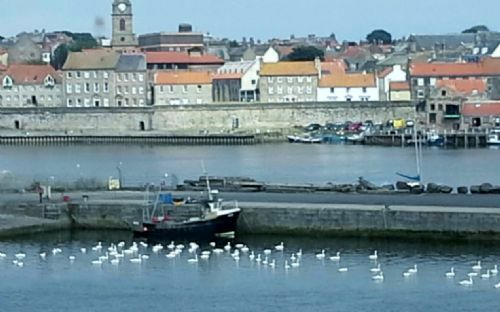 Berwick is the only real place for shops, but its only a short drive , or a couple of hours on foot along the river. The cottage is small, but has everything needed. It was warm and comfortable for a February stay. Although there are no shops or amenities in Paxton it is only a short drive to Berwick for supplies. It is a shame the local pub is closed for refurbishment currently as this would have added to our enjoyment of the holiday. The parking space and garden being separate from the cottage is not ideal. A warm and welcoming tiny cottage that has everything you'd need. Comfortable living and bedroom with beautiful en-suite. Dedicated parking very close by. Excellent! Highly recommended. Comfortable and well furnished with a clever use of space. Welcome basket was a lovely touch. Bathroom with walk in shower was fantastic. Excellent accommodation and very well equipped. Ideal for a cosy weekend (or longer) break for two. The owners contacted me to make sure everything was OK and even popped round to see me even though they had only just returned from their own travels. Unfortunately I was out, but it was a nice gesture anyway. The parking space, which is further down the lane, could do with a "Tweed Cottage" sign. I arrived when it was very dark and raining and there are two spaces. I parked in the farthest one and hoped it was correct (it was). Lovely cosy cottage for a couple xmas stay! Fantastic little modern refurbished cottage. One main living space and ensuite bedroom. Superbly cosy and quiet. Lovely little village not far from A1 to get to all the sites of northumberland! We have used Border Holiday homes now for a lot of years and it shows how much we enjoy staying with them as we keep returning .We will hopefully be returning again early next year . We very much enjoyed our stay in this lovely wee cottage. It has everything you need. Well equipped kitchen including dish washer. Comfortable bed. Good size bathroom. Stayed in this gorgeous little cottage in beautiful surroundings. There was nothing this little cottage never had, comfortable and cosy. Would definitely go back. Took our dogs for long walks in the Paxton Estate, going a tour of Paxton House is a must. Our only regret is not being able to stay for longer! Tweed Cottage has been thoughtfully renovated and is appointed with enough of all the right things we needed for our long weekend stay in the Borders and Northumberland. It was beautifully quiet in Paxton and surrounding area, but close enough to the A1 and other main roads to get places for days out. If you appreciate lovely old cottages and understand the simplicity of a compact space with a lovely bathroom, useful kitchen and comfy bed and living space, this is recommended. It is only a 20 minute or so walk to Paxton House for the concerts, again all excellent. The accommodation suited me fine and I would like to book it again for next year if circumstances permit, short of living in Paxton House itself it could not be more convenient. Our dog made himself at home whilst unpacking took place ,a short drive into Berwick Approx 4 miles to local supermarkets Asda Tweedside or Tesco on the outskirts are easy to find too. As a lovely touch the owner Christine finally caught up with us to say hello before we left as we were out every day touring so missed her but we did get a call on our first day hoping all was ok . Thanks for your very appreciative words. The work on the pub is expected to finish mid September. We have all missed the food and the real ale but there are some excellent pubs in nearby villages fortunately. Do come again. A perfect little cottage in a lovely village in a gorgeous part of the world. We were greeted at the door, given local eggs, biscuits, juice and fudge. If you are looking for a base from which to explore the Borders and Northumberland Tweed Cottage is perfect. The area nearby is very beautiful with wonderful beaches at berwick and the farne and holy islands close by. The cottage was lovely with much care taken over little homely touches. A very comfortable cottage, fully equipped for 2 people. Ideal location for exploring the areas history and many small towns, or visiting the stunning countryside and beautiful coast and beaches. We had a lovely stay in Tweed Cottage, a pleasure to stay off longer in a area we too often pass through. Lovely beach and inland walks - definitely worth a revisit. We really enjoyed the cottage, it had everything provided that we needed. A lovely welcoming basket was a very nice touch. The area itself is spectacular with plenty to do and see. We were so lucky with glorious weather. Tweed cottage is beautiful. It's well appointed with every modern convenience you could wish for. Christine &John, the owners are on hand to help with any query you may have. It is close to the lovely town of Berwick on Tweed where there are a variety of shops. The scenery is beautiful. There is a local pub in the village which at the time of writing we haven't usef, but will probably do so before we continue our holiday. Tweed cottage is situated down a very small lane and it has its own parking space which is a bonus. Paxton is a pretty village, there are no shops though which isn't a problem because Berwick is so close. We have had a very relaxing few days here. It will be hard to tear ourselves away. The cottage is a credit to them - it is clean, tidy, well presented, and the best equipped cottage we have ever stayed in, with copious quantities of towels, kitchenware and the like. The location is excellent, less than 10 minutes drive to the A1; and 15 minutes from Berwick, which has 3 x supermarkets, a fuel station and a large selection of shops, banks and a couple of cafes. Other reviews state that the cottage is small, which it is, however we did not find this an issue at all during our week long stay, in fact the cottage was bigger than we had been expecting. We visited lots of places in Northumbria and the Borders, and also did some cycling (Paxton is adjacent to national routes 1 and 76, and also the Tweedway. There is also a coastal path nearby for shorter or longer walks by the sea. All in all, an excellent stay. We would certainly stay in this cottage again, and would wholheartedly recommend it to others. A very good, clean cottage. Most equipment you could require was provived. Local pub did good food and allowed dogs in the bar area where you could eat. No shops in the village, but Berwick not that far away with a number of supermarkets. A great area to stay with good beaches and Castles a plenty. Thanks for your review. It is appreciated. It is a pity that the village shop has gone but ,as you say, it is only 3 miles to the full range of shops in Berick and only five miles to Chirnside. We do now have a mobile bank coming on a Tuesday so that's good. Well equipped and comfortable holiday accommodation in an attractive village setting. An ideal base for exploring other parts of the Scottish Borders and Northumberland. Highly recommended. Thank you for taking the time to write a review. 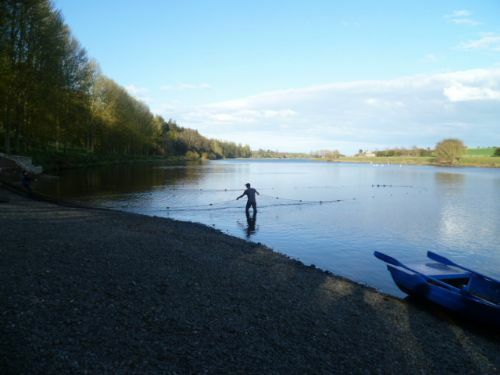 We agree that it is an excellent base as you are close to the coast and within walking distance of the River Tweed and Paxton House. I hope that you will visit again. it needs decorated and updated in lounge area . rest of cottage was fine . before you step out the door . cottage was ok but not for us . Lovely well equipped cottage in quiet village of paxton. On arrival at cottage first impression was "this is really nice" lovely welcome basket with Scottish Fayre. Cottage has everything you require, also shower was "brilliant". Location excellent for beautiful beaches, woodland areas for dog walking. Places we visited were Berwick on Tweed, Holy Island, Seahouses, Bamburgh, Eyemouth which are all 10 to 30 away. Overall we had a lovely time with our dog and hope to return soon. Enjoyed our stay, many thanks. Thank you for such a lovely review! Christine and I do our best to make each place good to stay in but very individual - we're a "couple" too and we have a very active dog! We love the Borders and the sea and make a point of staying in all our places every year. Unfortunately our stay was cut short , due to being involved in a car accident. We booked from Friday to Friday, but the accident happened on Tuesday.we then returned home. that was the day we went home. we have seen in hired accomadation in fact. We would recommend the holiday cottage to people we know. It was very kind of you to take the time to write a such a nice review after your unfortunate car accident and that you have fully recovered. I do hope that you will be able to come again to the area and stay at one of our cottages. Our new ground floor apartment near the beach in Berwick will be available very soon. We had a very comfortable stay in this cosy cottage. Quiet village, but very close to all areas of interest both north and south of the border. Well equipped with a lovely welcome pack of local produce. The owners are very close by and are keen to ensure a good holiday. Excellent information provided in the cottage. Thank you for taking the time to send in a review. John and I are delighted that you found the cottager so comfortable and loved the area. We wish you well in your search for a home of your own in the Border region. Please do come again. We had a wonderful time staying in this cottage. It is conveniently located to visit many interesting places, like Rosslyn Chapel and Jedburgh. The cottage is small, but wonderfully equipped, with many special touches. The welcoming basket with local products was very sweet and there were already some basic supplies available (milk, eggs, etc.). When booking a cottage we are used to bringing our own towels and linens, but that wasn't necessary here. We loved the wonderful smelling fluffy towels. On the day that we arrived, the owners weren't able to greet us in person, but they asked a friend to come check in on us to ask if everything was okay, which was very thoughtful. Throughout the cottage the owners have taken great care to make our stay as nice as possible, for which we were grateful. This is a great place to relax and if we ever wish to visit this region again, we'll make sure to check if this cottage is available. We are so pleased that you liked the cottage and the historic Scottish Borders. Sorry that we didn't meet with you but hope to see you at one of our other cottages in the future. Thank you for your kind comments. A very attractive cottage in a charming village. Great shower, comfy bed and even a dishwasher for two. Great Sunday lunch in local pub. Nice walks. A great base for visiting the borders. We had a wonderful 4 days in Tweed Cottage, Paxton. Cottage very comfortable. Everything you need for a relaxing time. The owners John and Christine were very welcoming. The local 'basket' was full of local of delicious produce. Would definitely recommend this cottage and this part of Scotland. We thought Tweed Cottage was lovely and found it larger than we expected. The owner was there to greet us and give us helpful advice on our arrival. He told us how to find dog walks close to the cottage. Where the path to the Whiteadder was and the best walks round Paxton House grounds. There are also lots of leaflets in the cottage giving details of local attractions. The cottage is well decorated and there was plenty of room for us and our large dog. We especially loved the bathroom with the large shower. The table set for a meal made the cottage look very welcoming when we arrived. When the local pub was shut we went to the Salmon in East Ord, only a short drive away, for a meal. Dogs were allowed and the food was excellent. It wasn't the time of year to sit outside but there is a garden area when you get the weather. This is somewhere we would stay again if we are visiting the area. Thanks for taking the time to give a review. The area is good for walking a dog, and there are a number of welcoming pubs within a short drive where tasty food is available. We hope to see you again one day soon.